Over the water bungalows in St. Lucia say what?!?!?!?! That’s right and you heard it here 1st!!! As if Jamaica wasn’t enough (yes, bungalows in Jamaica too!! Read more about that in a later blog), they are now coming to beautiful picturesque St. Lucia!! If you follow anything travel related then you know that they have been saying and we have been waiting for years….. Well I’m happy to report that it’s finally happening!! Sandals Resorts is introducing a new version of their Luxury Included Experience and introducing 9 NEW Over-The-Water Bungalows! Where exactly in St. Lucia will these breathtaking bungalows be located? They are coming to Sandals Grande St. Lucian on the calm Caribbean Sea waters of Rodney Bay! I couldn’t think of a more superb location if I tried 🙂 So what’s Sandals have to say about these beauts?? “These gorgeous over-the-water bungalows convey an intimate connection to the Caribbean Sea and deliver complete immersion of the fine turquoise waters and rich marine life below. Glass floor panels and lit water ensure you can enjoy undersea views at any time. Couples can also admire the beauty of the ocean from their private outdoor Tranquility Soaking Tub for two or over-water hammocks. Every bungalow captures the height of luxury with hardwood floors, vaulted ceilings, custom crafted king-size beds adorned with soft linens and plush pillows for the ultimate sleep experience. Inside, each bungalow is also equipped with a smart TV and a large ceiling fan to stay cool while enjoying fresh Caribbean breezes. The bathrooms are equipped with his and hers sinks, a large backlit mirror adorned with mosaic tile, and a walk-in rain shower. Outside, your private patio is also equipped with an extended sun deck, outdoor shower, sun loungers, and a bistro set for two. Butler Elite service, which handles every detail of your vacation with unobtrusive grace, and 24 hour room service are included to complete your over-water vacation”. Impressed? So am I!!! And if these are anything like the bungalows they debuted in Jamaica (which are almost booked solid for the next 2 years), these are going to book out equally as fast! Are you ready to be one of the 1st to experience over the water serenity in St. Lucia? With big announcements from both American Airlines and United Airlines this summer, I am almost feeling like instead of Friday or December 18th, today should be called “National New Flight Service Day”! These great new flight options will not only allow us to get you to the Caribbean easier then ever but also quicker then ever! First up- American Airlines begins its Nonstop flight service from Los Angeles to Montego! Such exciting news for the West Coast!! Next up- United Airlines beginning December 19th will launch Nonstop flight service out of Chicago to not only Providenciales, Turks & Caicos but also St. Lucia! Make sure to contact Life’s A Trip Travel for more information on these great new flight options! Just in time for the holidays and meeting their December 15th construction deadline as promised! Sandals Grande St. Lucian Resort opened to doors to their 3 Brand New Discovery Dining options! The Bombay Club (pictured below) features Indian Style Cuisine! Kimonos (pictured below) features Japanese Teppanyaki Hibachi Grill style dining! Soy (pictured below) features made to order Suchi bar style dining! The completion of these 3 restaurants brings Sandals Grande St. Lucian’s total to 12 now! However guests of staying at any of the 3 Sandals Resorts in St. Lucia will also benefit by the addition of these new dining options thanks to Sandals exclusive “Stay at 1 & Play at all 3” complementary exchange program! Contact Life’s A Trip Travel for more details on these new quality inclusions! 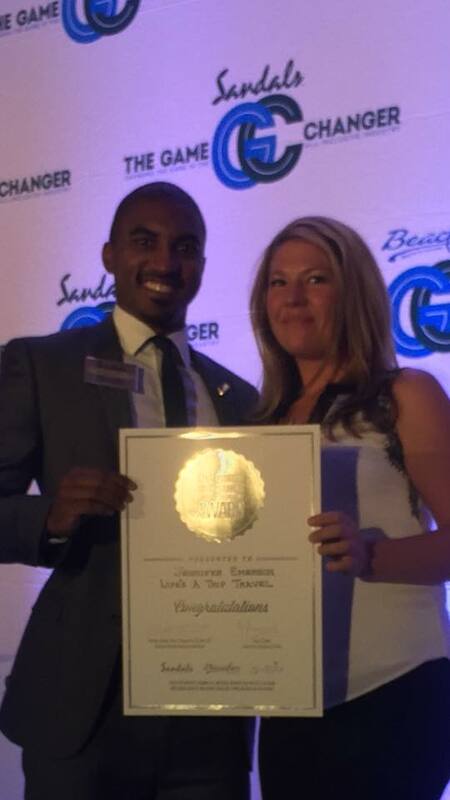 #SandalsGameChanger ~Our Girl Is On A Winning Streak! 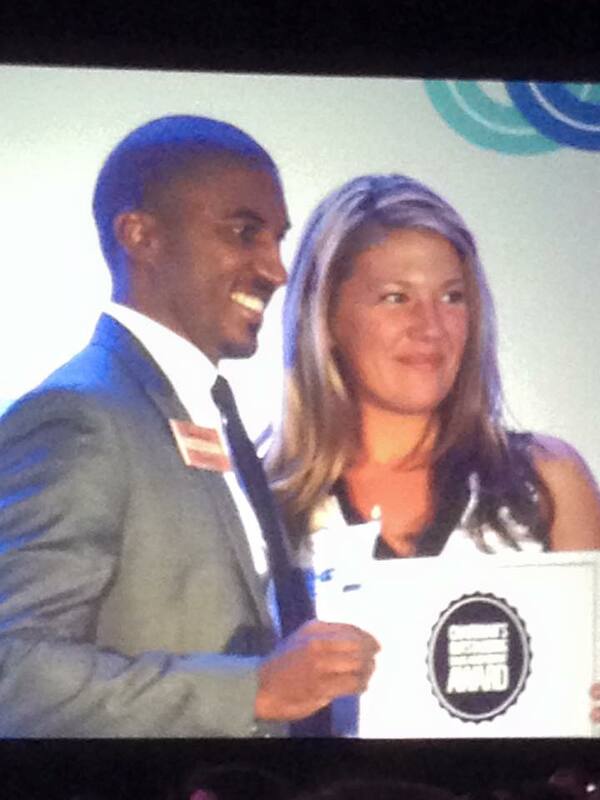 Life’s A Trip Travel recently attended the Chicago #SandalsGameChanger 2015 Unveilings. An event where Sandals & Beaches resorts invites a select number of travel agencies and their agents to come meet with their executive team. We learned all about the future of the brand and how they are gearing up to “Change The Game” in the all-inclusive industry! There was also an awards ceremony held during the #SandalsGameChanger to acknowledge a select number of their top travel agents. 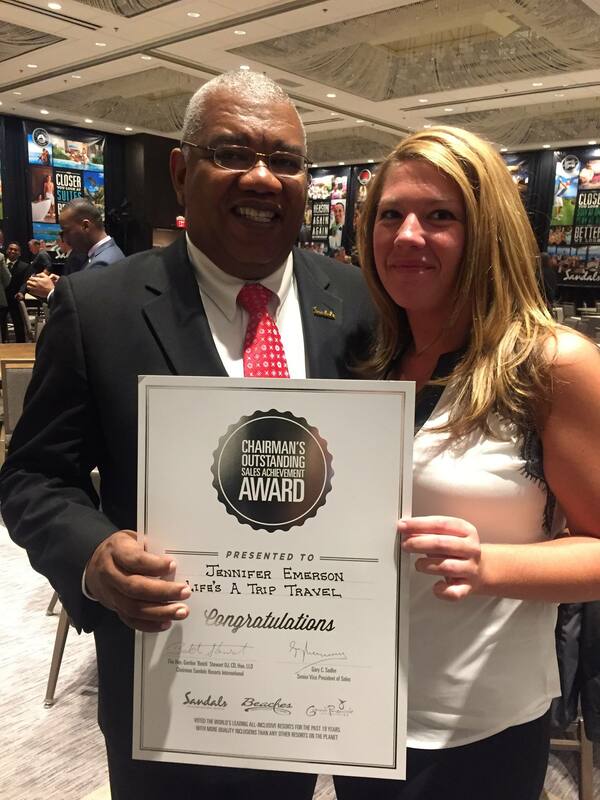 Of course at no surprise to us, our girl was at it again… 1st winning the #LEGENDSOFLOVE contest for writing about how she first fell in love with Sandals Resorts and then being awarded the “Chairman’s Outstanding Sales Achievement Award”! 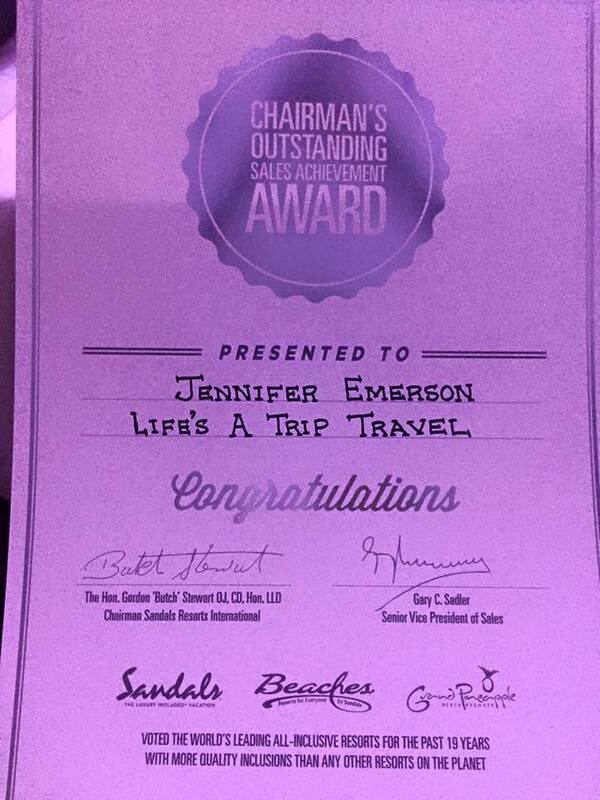 Keep up the amazing job you are doing and Congratulations to Jennifer, our little Sandals Queen! *Pictured- Jennifer & Stuart Levy -Business Development Manager for Sandals & Beaches Resorts/ Jennifer & Mr. Gary Sadler -Sr. Vice President Sales for Sandals & Beaches resorts.